Its Spring-time in the southern sierras, and wildflowers & green grass are reemerging along the tackier-than-usual trails in the Kern River Valley! By the looks of it, the Keyesville Classic is going to ROCK this year. There's an impressive list of sponsors (lots of swag! ), a poker and night ride, girl's bike-apparel fashion show, bike movie screenings (including the Southern California premier of Awesomeland), a kid's race and raffle, BBQ's, and always a party at the Kern River Brewery. The race attracts every level of rider, from novice to pro, and offers Short Track, Cross-Country, and 2 Downhill Courses. In the All-Mountain Stage Race, riders tackle all the courses on one bike. There are also a Trials competition and a Vintage Class bike race. GPS Race Tracks: Here is a GPX file with the Short Track Course, Keyesville Classic XC Race, Dutch Flat DH, and Snake Pit DH tracks. 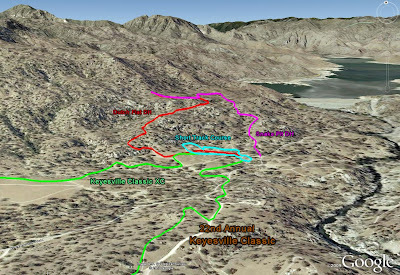 More Rides: Nearby, the popular Kern Canyon Trail continues past the Keyesville Classic loop. Dutch Flat area trails are all being ridden, but if you want to ride Just Outstanding you'll have to bring your tele-skis. A few feet of shreddable corn snow is covering much of the Greenhorns and Kern Plateau. Near Kernville, Whisky Flat and Bull Run Trails are in great condition, and the poppy-laden hills of the lower the Cannell Trail network is getting more colorful by the minute. Local Bike Scene: In Kernville, Bionicon Backcountry Mountainbikes is settling into their new USA headquarters and offering free demos on their assortment of bikes. The same building will also house Ride KRV, a full service bike shop. Extremeline Productions (ya, thats us!) 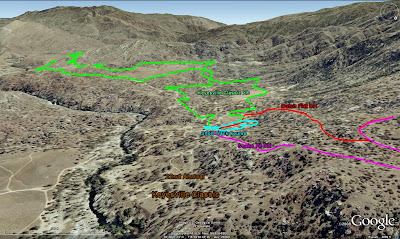 is developing a multi-sport topo adventure map for the Kern River Valley region. If you have any ideas, comments, suggestions let us know. A new BMX Track, Pump Track, and Mountain Bike skills park are approved and being developed in Kernville near the rodeo grounds. Bionicon and local riders are working with the BLM to add more singletrack to the local trail network.